When I started this blog about 6 months ago I have to admit that I knew relatively little about Cincinnati breweries and their beers. Even though Columbus is only about 100 miles away most of the new, up and coming Cincinnati breweries don’t distribute here. I still have a lot to learn, but all of the Cincinnati-area beers I have been fortunate enough to try have been somewhere between very solid to spectacular. You can check out my reviews of Fork in the Road, an India Amber Ale by Blank Slate, or Zoetic, a bright fresh-hop IPA by Yellow Springs Brewery. I’ve had a chance to try (but not yet review) Truth by Rhinegeist, which impressed me. All three of these beers are well worth seeking out and I would strongly encourage you to try them if the opportunity presents itself. In this review I focus on another Cincinnati brewed IPA, PsycHOPathy by MadTree. I first became aware of PsycHOPathy when reading Tom Aguero’s post on his top six Ohio Beers for Bryan Roth’s Six Pack Project. A couple of weeks back my wife was going down to Ikea in Cincinnati and I convinced her to go a little out of her way to pick up both of these beers and bring them back to Columbus (with beer hunting directions kindly supplied by Tom). So here are my thoughts on PsycHOPathy, which according to Tom is the first Ohio craft beer to be canned. PsycHOPathy pours a deep golden color with plenty of effervescence and three fingers of fluffy pure white head. The aroma is a mix of floral notes, grassy fresh-picked hops, and citrus fruits. It’s not the most aromatic IPA I’ve encountered, you have to put your nose in the glass to get a good sense of it, but what you do smell is inviting. The enticing aroma makes for little delay in the transition from my first smell to my first taste. My tongue is greeted with quite a bit of fresh grassy hops early, followed by citrus, and finally a touch of pine on the finish. For an IPA that has this much hop flavor there is surprisingly little bitterness. I assume that comes from use of malts in just the right amount to balance the hops without drawing attention to themselves. The mouthfeel has a lively carbonation and the finish is crisp and clean. Overall I’m very impressed with this beer (and a little sad that my six pack is now all gone). It’s got a lot of tasty hop flavor/aroma paired with low bitterness that makes for extremely high drinkability. I’m guessing that Mad Tree dry hops this beer in a big way, because it reminds me a little of beers like Founders Harvest Ale, Trailhead, or Zoetic, but at the same time it is less grassy and has a better hop-malt balance than any of those beers. Reading Tom’s review at Queen City Drinks I see my guess is correct. 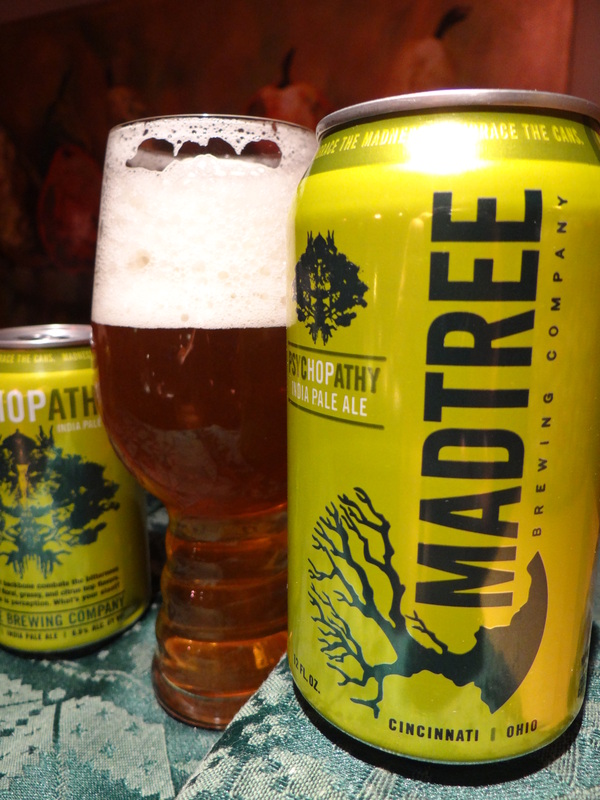 According to the brewers at Mad Tree PsycHOPathy is dry hopped with a generous helping of both Chinook and Centennial hops. If you are looking for an IPA with over the top hop presence like White Rajah, Headhunter, or Two Hearted Ale you might be let down, but if you like your IPAs flavorful with a relatively low level of bitterness you’re going to be very satisfied with PsycHOPathy. In that sense it is a little like Mystic Mama from Jackie O’s in Athens. Fellow central Ohio hopheads if you are in the Cincinnati/Dayton area it would be well worth your time to pick up a six-pack (or more) of PsycHOPathy.